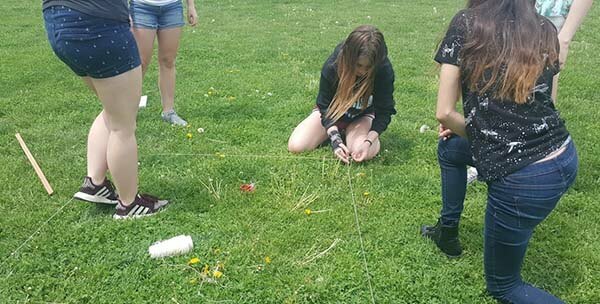 Students model how field biologists would use a sampling technique to estimate the number of sunflowers in a field. First, they choose 10 plots at random by choosing paper slips, then take the average of those plots. The worksheet walks them through the steps of then using the average and the overall size of the field to calculate the total number of sunflowers. Students then compare their estimate to the actual number of sunflowers on the grid. Analysis questions ask students to apply what they have learned to other situations. I have also used this activity with actual sampling. You can flip this to an inquiry lesson by asking your students to figure out a way they could determine the number of dandelions in a school area. I give them meter sticks, string, and tell them the area of the field. In groups, they go outside and see what they can come up with. With a little guidance, most groups do come up with a sampling technique, though the “random” part is usually elusive at this point. Most of their estimates are really high due to the fact students will non-randomly choose plots that have a large number of dandelions and ignore spaces that have few or none. 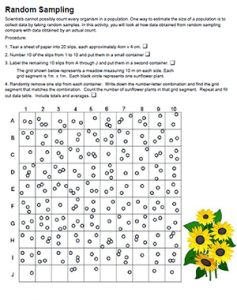 When returning to the classroom the next day, we can refine the technique using this worksheet as a model and discuss why their initial dandelion estimates may not be accurate.